The complete Bob Wilkins Creature Features is a video scrapbook covering Wilkins entire run as host of the Creature Features program in San Francisco. While a complete list of all of the films he screened appears at the bottom of the screen we are treated to clips from the run of the show and a post series interview with Wilkins. Okay I know you’re going I didn’t grow up in San Francisco so I don’t care about Wilkins, perhaps you feel that way now, but you will care. Wilkins was a soft spoken host with a dry wit and a wicked sense of humor. In addition to doing extremely entertaining host segments he did some great interviews with the actors and actresses that appeared in the genre films he was running. As many of you know I live on the wrong side of the country but I discovered Wilkins via current movie host Mr Lobo. Lobo had released a program where he hung out with his idol, Wilkins and talked about things. While not the best show case of Wilkins wit, it was a way through the door. I next ran into Wilkins when I ran into the video releases of John Stanley, who took over Creature Features from Wilkins. Stanley is the author of some of my favorite film reference books, the Creature Feature Film Guides. (An aside- I had become interested in Stanley’s TV work when I saw picture of him and was struck by how much he looked like the Shape who hosted the NYC version of Creature Features. Regrettably they were not the same person) After I had gone through Stanley’s DVDs I picked up some of the Wilkins ones. I then recently picked up this DVD and three others from November Fire. This video release is a kind of greatest hits highlight reel. I say that because there is actually a DVD out that is supposed to be Wilkins Greatest Hits. This is a year by year look at Wilkins and the show. As I said it’s a mix of clips, trailers and interviews. It’s a great deal of fun. I want to stress this because when I started the DVD I was a little thrown off. What had I picked up? It was some off clips that didn’t quite mean anything to me. And then the interview started and I was enraptured. Yea, the clips are good but the joy here is listening to Wlikins talking about doing the show and that makes everything else work. I mean listening to him talking about interviewing Boris Karloff and having him make fun of him is a blast, especially when he adds that after doing the bit Karloff wanted to do it over again to seem less mean. This disc is a great deal of fun, even if you don’t know Wilkins. Its simply good time with a good guy. 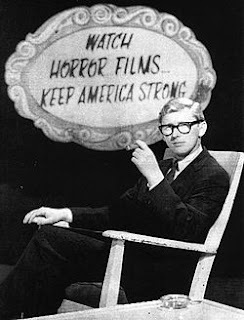 Loved Bob Wilkins Creature features.